For Valentine's Day, Rainbow Honey created two numbered, Limited Edition polishes to be given away with orders of $50 or more (choice of one polish) and $100 or more (set of both polishes). I spent $105 (group-buy with a friend of mine who let me keep the GWP polishes), so I got both! So far, I have only tried Dearly Beloved. Dearly Beloved is a densely-packed mix of glitters in a clear base. It contains red hearts and squares and a mix of tiny gold glitters and shimmer particles. I did have to fish a bit for the hearts, but it wasn't a nightmare or anything. 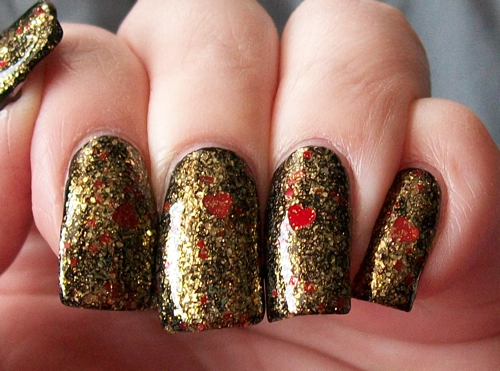 The gold glitters/shimmers and red squares distributed easily across the nail with no clumping or bald spots. Shown here is 1 coat of Dearly Beloved over one coat of Cult Nails Nevermore*. Dearly Beloved is still available as a Gift With Purchase, but if you want it, you may need to act quickly. You can buy Rainbow Honey products HERE. *Nevermore is a beautiful one-coat black, but I can't really comment on its formula yet. My bottle of it is always rather thick and fussy, so I contacted Cult Nails and was told that there is likely a defect in the bottle causing a poor seal and letting air into the polish. I will soon be receiving a replacement, free of charge! Cult Nails provides excellent customer service. You can purchase Nevermore HERE.